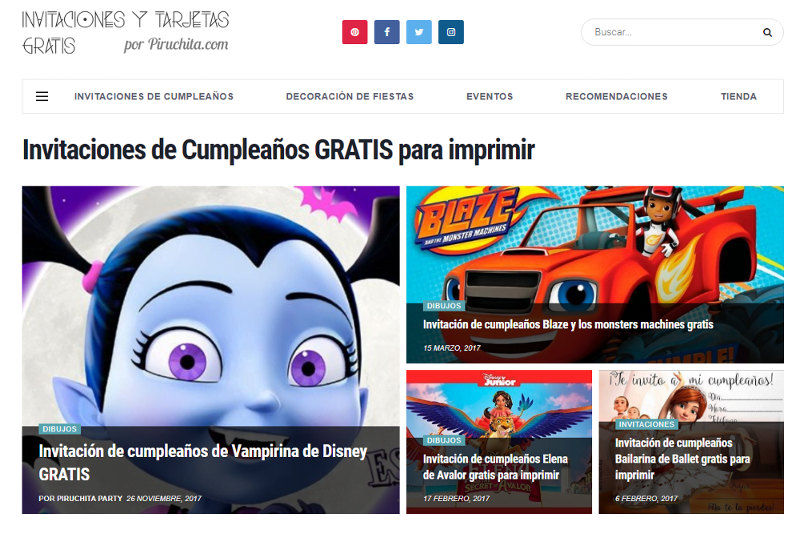 Sergio Alfaro of the online shop Invitaciones y Tarjetas de Cumpleaños GRATIS needed a way to maximize his site’s performance without introducing third-party-plugin conflicts. LiteSpeed Cache for WordPress to the rescue! 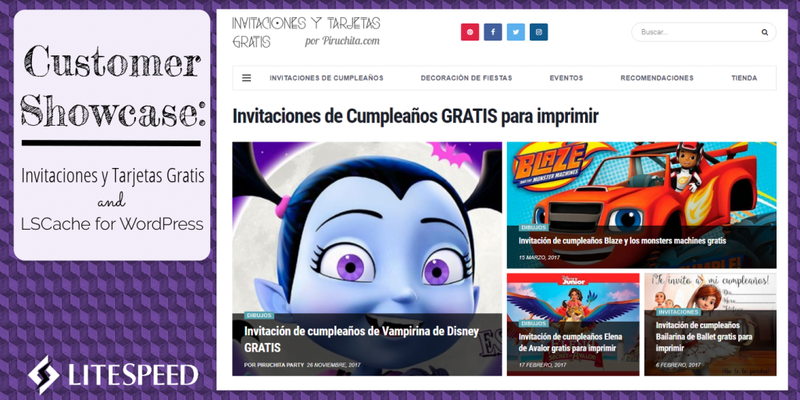 Below is the Invitaciones y Tarjetas de Cumpleaños GRATIS story as told by Sergio to LiteSpeed. Read on to see how LSCache Provides All-in-One Optimization for WordPress! 3rd Party Plugins: LiteSpeed Cache, Yoast SEO, All in One WP Security, Complete Analytics Optimization Suite, Mailster, etc. Avoid having to use a lot of plugins to optimize the website, manage the CDN, manage cache, etc. We used a “shared hosting” wordpress specialist hosted in Spain. I say “shared hosting” but really they were bigger dedicated servers with a small number of accounts assigned to each one and they used Cloud Linux to assign the resources. Along with the host’s own WP plugin, I used the premium WP Rocket plugin and tried the Autoptimizer plugin, too. I was hoping that the speed would be better than before, especially the time to first byte, but the total time to load continued to be very high in all combinations I tried. Another big problem was that the cache expired quickly and needed to be re-cached manually by the visitors. I dedicated several weeks to testing other solutions: W3 Total Cache was very complex, introduced many issues for my website and didn’t give me good results. WP Rocket worked easily and provided better results on speed test pages but really didn’t improve the total load time very much. I tried many other caches and optimization plugins but the best I was able to achieve was to load the homepage in around 3.5 seconds. Internal pages that had Adsense loaded in 5-10 seconds. The Pagespeed/YSlow scores, Pingdom and Webpagetest normally resulted in C or D scores and were never better than a B. Now we have our own dedicated server where we store a lot of websites, many of them complex multistore/multilanguage Magento stores using the LiteMage plugin, along with several WordPress sites. For this reason, we use CloudLinux too, to work exactly in the same manner that our previous hosting did: separating all of the WHM accounts and limiting the assigned resources. In this way, we can provide unlimited resources to some domains and limited CPU/RAM to others. We have had amazing results with a Magento store that was hosted by Aspiration Hosting,using LiteSpeed Web Server with LiteMage, so we really are big fans of LiteSpeed. And so without any doubt, we bought a 4 CPU license for this server. For the https://www.invitacionesytarjetas.gratis website we limited the resources to 2 CPU cores and 2GB of RAM too: exactly the same as in our previous hosting. We installed the LiteSpeed Cache plugin for WordPress, and without modify anything, we noticed a very big speed improvement – simply using the default setup. And once we saw that this plugin is a really an All-in-One optimization suite, we started playing with different options. Cache: All options enabled except Cache Mobile. Tuning: We’ve excluded one JS file from minification to avoid a conflict with another plugin. This is an awesome feature because you can continue using the Minimize/Combine JS options without the need to fully disable them if a conflict arises. Media: LazyLoad features are off because our template already handles that feature. Image WebP Replacement is enabled. CDN: We have enabled Cloudflare. We use the free account, as our website is worldwide oriented in the Spanish language, not only for Spain, and a CDN can always help. We set Load JQuery remotely to Google. Everything else uses the default setting. Another great feature integrated in the plugin is Image Optimization. We have achieved Level 5 here with all images optimized: in total, 2429 images optimized and converted to webp format. I can’t forget to mention the amazing crawler feature. We are using Yoast’s sitemap.xml to be sure that all posts and pages are properly crawled and cached. This tool helps to minimize the number of uncached pages a visitor will encounter. So we are very happy with our LiteSpeed server in combination with the LiteSpeed Cache WordPress plugin. We noticed an increase in organic traffic from Google within days of switching. No one can confirm that the main reason for such a gain is the 300% improvement in speed, or the exceptional ratings according to the Google requirements and guidelines, but at this screenshot from the last 30 days. Coincidence? You no longer need to have 3-4 different plugins to achieve what you need. Often the use of multiple plugins can introduce conflicts. Finding the right combination of plugins with a good collection of features and the ability to work well together can be a challenge. LiteSpeed’s plugin has the server cache, CSS/JS minification and combination with the option to exclude some files, CDN support, DNS prefetch, a built-in crawler, image optimization, and many more advanced features. Even better? You can install the plugin, and using the default options, start to see improved performance immediately. After a while, you can start playing with all of the options, enabling and testing the results to discover the combination that is best for your site. We see how the LiteSpeed team works very hard adding a lot of new options each week to their plugin. They listen to the users demands, issues notifications and fix problems quickly. So, you can expect the best real solution for your speed problems. PHP 7 vs HHVM Benchmark Series 3: How fast can WordPress go?